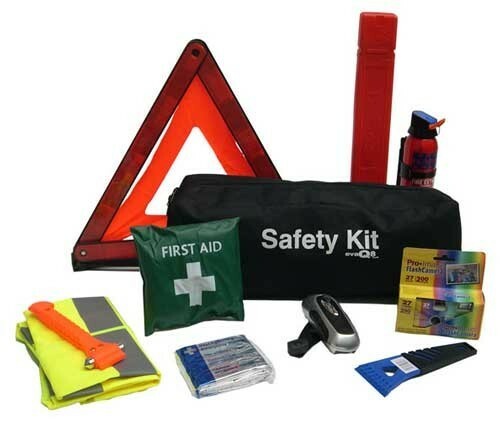 Safety kits are one of those things that you never really think about until it’s too late. “Be Prepared” is the motto of the Boy Scouts of America, so we asked them for the best advice about what should go in an automotive safety kit. We also called upon the National Highway Traffic Safety Administration (NHTSA), AAA, and several state transportation agencies to come up with a simple list of 15 items anyone can buy at your local hardware store or retail outlets. 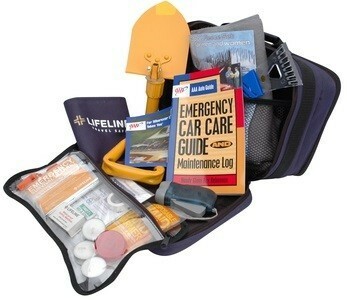 Some of these items are for drivers who live in states where it snows. But, if you think about it, there are really only three parts of the country where it’s unlikely to snow regularly, and that’s Hawaii, Arizona and South Florida. So, if you live in those regions, this list goes to 12. 1. Charged Cell Phone. Although this item will probably be in your possession each and every time you’re in the vehicle, always make sure to have one cell phone (or even two if possible) when you’re going on long trips. Also, make sure it’s charged and have a car charger at your disposal. 2. 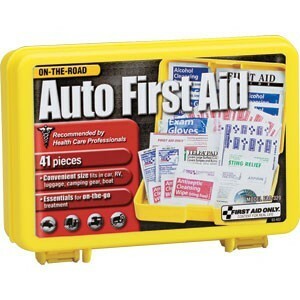 First-aid kit. As well as an assortment of Band-Aids, it should include adhesive tape, gauze pads, aspirin, antiseptic cream or ointment, antiseptic wipes and anything else your family may require. Also include a warm blanket or two into the kit. 4. Three reflective warning triangles. While many prepackaged emergency kits contain one warning triangle, we suggest you have three that are placed 50 feet apart to warn oncoming traffic. 5. Tire gauge. Motorists should use the tire gauge in their car emergency kit to periodically check the air pressure in their spare tire. In many cases, people ignore it until they have a flat and then find out that the spare is flat as well. 6. Foam tire sealant. A quick, inexpensive way to repair many flats without changing the tire is by using one of these foam tire sealants. 9. Tow strap or tow rope. It should be strong enough to tow 6,000 pounds. 10. Multipurpose utility tool. This can be something like a Leatherman Tool or a Swiss Army Knife. 11. Drinking water. Common sense-- It’s not for the radiator, it’s for you! 12. Non-perishable snacks. Protein bars are a good choice, because they won’t take up too much space and they’re easy to eat. 13. Snow shovel. Can be used for a wide range of pruposes. There are retractable ones for space-saving concerns. 14. Cat litter. It works as well as sand beneath the tires for traction and weighs less. 15. Windshield ice scraper. Keep the visibility high and drive on, even in cold weather. If you can have these items in your vehicle, you’ll be more prepared than your average Boy Scout while attaining that secure peace of mind everyone wants. You won’t ever get caught out on the roads of America if you purchase the valuable, potentially life-saving items on this list.